GYO: grow your own, grind your own? I’ve been into growing my own for a while; involutarily for bits of my childhood and voluntarily as an adult. Sometimes that’s a little pot of mint or chives or it may be a community garden plot (or as much space as I can protect from the deer!). I find it remarkably satisfying to see the seeds sprout and the plants grow. Since moving home, I’ve been puttering around with a handcranked grain mill. There are distinct advantages to using a grain mill, but I suspect it’s not for everyone. It may not be for my daily life! 1) Frugality. You can often buy whole grains in bulk for a lower per pound price than cracked or ground grains. Whole organic buckwheat, for example, is $1.60 per pound while organic cream of buckwheat (bought in 12-box increments) is $4.64 per pound. 2) Exercise. It’s not that much work, but it does help you incorporate a little extra movement into daily life. 3) Independence from electricity. While we mostly have it, being able to create food without it is a handy skill. 4) Cooking to your taste. Grain mills also allow you to easily customize your own flour mixes, or hot cereal blends. 1) Time. I can buzz a bit of flaxseeds in a coffee grinder in about 30 seconds. Grinding them through the grain mill takes much longer. Grinding for one or two people isn’t bad, but if you were grinding for a large family, you might have to coerce a child or two into doing a little of the work. 2) Equipment. While not terribly large, it does require a little more cabinent or counter space. 3) Initial investment. They are not cheap to buy, although they do pay for themselves quickly. The one I’ve been using is the handcranked Family Grain Mill ($139) while there are many models availabe with various capabilities. Eating 46 lbs of buckwheat cereal would pay for it, for example, and more expensive flours like almond or quinoa would pay for it more quickly. Feed the buckwheat through the mill, using the coarsest setting. 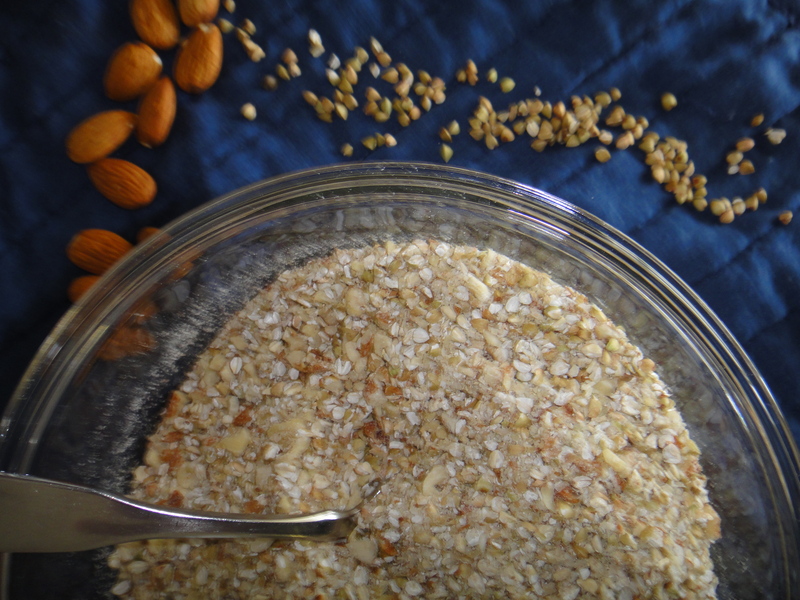 Coarsely chop the almonds, and feed them into the grain mill as well. Mix well, and store in an airtight container. To serve, place 1/3 c cereal mix in a bowl with 2/3-3/4 c hot water. Soak briefly, and then cook in the microwave for 5 minutes at a 50% power settings. Thin with additional water if desired. Stir, taste, and cook longer if necessary (your grain mill’s settings may vary, affecting the cooking time.) Top with milk, applesauce, chopped fruit, ground flaxseeds, pumpkin, and/or spices to taste. I’ve never considered a grain mill before but I really appreciate your balanced assessment of it. Sounds great but my tiny kitchen space would definitely be a hindrance. But I do like the idea of trying it in my coffee grinder! You do have to be careful with the coffee grinder and how fine it grinds– I’ve ended up with borderline almond paste– but it’s quick to just buzz a little grain through it. If you’re trying a recipe that calls for 1/4 c of millet flour, for example, it’s cheap and easy to DIY instead of buying a whole bag. I really enjoyed this post! I have been considering purchasing a wheat grinder or flour mill I guess its called but the expense is great and I don’t want to choose the wrong one. Although friends have all made recommendations I think to be truly self sufficient I may want to get one that does not require power but don’t know how much work it will be. Also thanks for sharing your recipe it sounds like its super simple which I love! Thanks so much for linking up to “The Ole’ Saturday Homesteading Trading Post” this week and I hope you come back soon! Mail Order Meal Kits — Are They Safe?